This is a simple and foolproof turkey gravy recipe. Its even more flavorful if you have drippings reserved from a roasted turkey! In a 4 quart saucepan, heat the stock over med high heat until very warm-do not boil. In another 4 quart saucepan heat the butter or the drippings with the flour over medium high heat, whisking until combined. Once the flour and butter are combined (this is a roux!) cook the roux, whisking continually until the roux becomes light brown in color, about 2-3 minutes. Add the hot turkey stock to the roux and whisk continuously to prevent lumps from forming (this is called a veloute). Bring to a boil and reduce heat to a simmer. Cook, stirring occasionally for 8-10 minutes. Add the lemon juice and a couple of good pinches of salt. Taste and adjust seasoning with salt. Don’t be shy here with the salt…this gravy can really stand up to some aggressive seasoning. Make sure to add your stock to the roux only when its hot. This will help prevent lumps from forming. If you do wind up with some lumps-just strain the gravy before you serve it! *If you have roasted a turkey or made our turkey stock, you will have drippings left over in the pan. 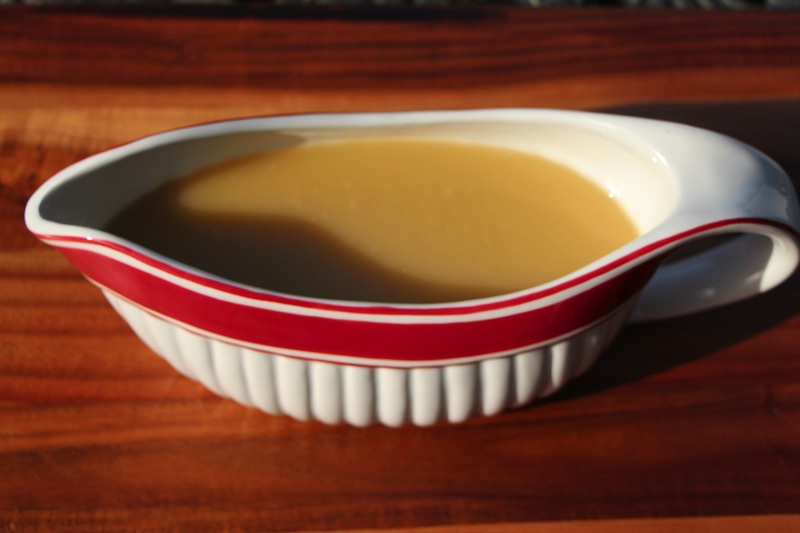 Simply strain the drippings into a fat separator of large measuring cup, let the fat rise to the surface, skim off the 4 tablespoons required, discard the rest of the fat and reserve the liquid to use in the gravy. Measure the defatted liquid and make up the difference with our turkey stock!